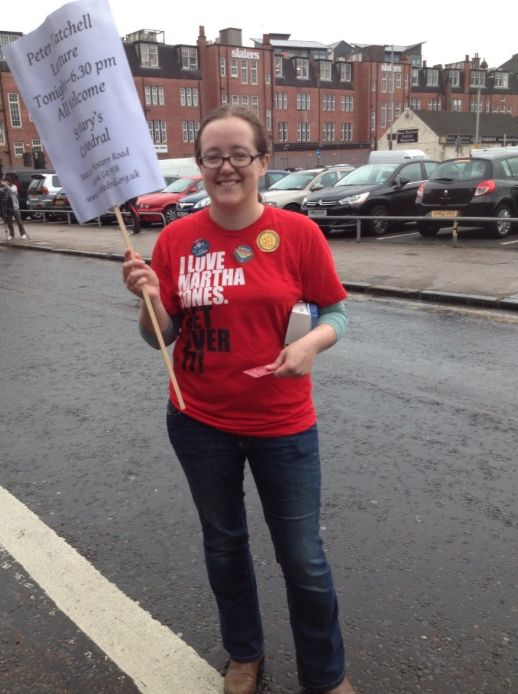 As we made our slow way back to where I had abandoned the car, laden with placards and banner and toddler, I was stopped by a gentleman asking whether we were going to a protest. He read the text of one of my by now quite soggy placards. “And, erm, were you protesting it?” he asked, looking hopeful. He didn’t like that at all. 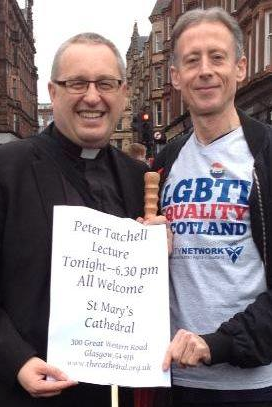 This entry was posted in Blog and tagged gay pride, glasgow pride, peter tatchell, scottish episcopal church, st mary's cathedral. Bookmark the permalink. Well done all. Sorry to have missed it all. Glad you all made the best of the rain. It’s a nice picture. What’s in the blue and white box?? A thousand small business cards with church service times and details of the Peter Tatchell lecture. I was dashing up and down the parade route handing them out, completely buzzed. Indeed, and the design is based on a Stonewall campaign. (“Some people are gay, get over it.”) It was a Christmas gift from two excellent friends who know me *very* well.